This is the first of many Valentine crafts that I have planned. 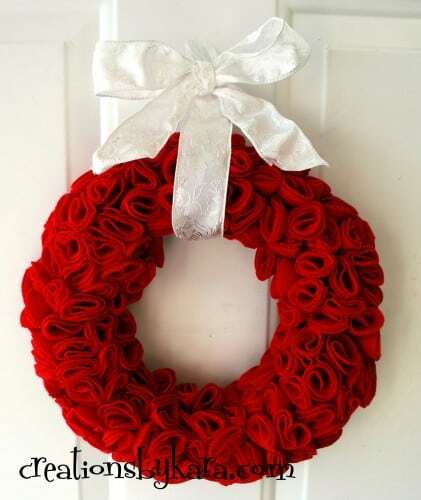 I’ve seen these gorgeous wreaths all over blog land, and have wanted to make one for a few weeks. I finally got around to finishing mine up. Isn’t it beautiful!?! I loosely followed the tutorial I found over at The Idea Room. You can find it here. Like she says, it is really simple, just takes a bit of time. I did a few things differently than she did. First of all, I didn’t have a heart wreath form. I just used a round one that I bought at the dollar store. I did that because I am cheap thrifty. Secondly, I used hot glue instead of pins to attach my felt to the wreath. That was just because I was too lazy and impatient to run to the store for more pins. Thirdly, she folded her circles in half, then in half again. After folding mine in half, I folded them into thirds. I thought it gave them more of a rose appearance and I liked it better. You can do it however you like it best. She attached the ribbon to the back of her wreath to hang it. I used some wide ribbon from the dollar store and wrapped it around the wreath. Then I glued on a bow. That is so pretty!! How do u think it would hold up outside on the front door?